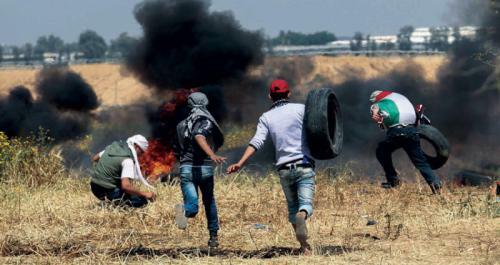 The ITIC’s annual study indicates that in 2018 there were two main trends prominent in Palestinian violence and terrorism: in the Gaza Strip there was a sharp increase in the level of violence and terrorism, after about three and a half years of relative quiet after Operation Protective Edge. One of the manifestations was 1,119 rocket and mortar shell hits in Israeli territory, the highest annual number in the past ten years (with the exception of Operation Protective Edge). In Judea and Samaria popular terrorism continued in its various forms, primarily stabbing, vehicular and shooting attacks. After popular terrorism peaked in 2015 its scope decreased, but in the last months of 2018 there was an increase in the number of attacks. In addition, a large number of popular terrorism attacks were also prevented. According to the head of the Israel Security Agency, 480 significant terrorist attacks were prevented, that is, close to nine significant terrorist attacks were prevented for every one carried out. The preventive activities and detentions carried out by the Israeli security forces indicates, according to the head of the Agency, the great potential for terrorism simmering under the surface (Israel Security Agency head briefing of the Knesset Foreign Affairs and Defense Committee, November 2018).